This is a masterful example of an oral interview. If the story is the heart of genealogy, then the oral interview is the heart of the story. Think of what is lost without the sound and music of this wonderful lady. Then consider how many people you know who have their own stories. Then think what would happen if that story was lost. Get yourself an inexpensive digital recorder and sit down and preserve the stories. It might be a good idea to be prepared. Take time to talk to the person who has the story. Help them feel comfortable with the process and let them handle your recorder. Make sure you get their permission to conduct the interview and have it preserved. In my current round of oral interviews, I have arranged with the L. Tom Perry Special Collections Library at Brigham Young University to archive, transcribe and catalog the interviews. This can be one interview or a whole series on a specific topic. There are dozens, perhaps hundreds, of websites dedicated to oral interviews. I suggest looking at the sites that are academically involved in collecting history and folkways. My favorite is the Library of Congress, The American Folklife Center. I have been listening to parts of the Alan Lomax Collection since I was a teenager. Another one of my favorites is Studs Terkel. On the radio for over 45 years, to quote his website, Studs Terkel discussed every aspect of 20th-century life with movers, shakers, artists, celebrities, and working folks. From civil rights to labor to jazz, his work spanned an impressive array of topics and figures. The current archive of his "interviews" is on Popup Archive.org. Don't get bogged down in dates, names and places. Tell your prospective interviewee that you are interested in stories. Don't stop them once they get started and stop asking questions as long as they talk. Do not ask for names and dates, ask for memories. I only wish I had done more interviewing and less talking. Don't get wrapped up in technique. Just let them talk. As genealogists are we governed by rules or principles? However, upon reflection, I guess the proper question to ask is whether we are governed at all? We recently did some construction, finishing off our basement. All through the process we had a series of inspections. When the job was completed, there were several items that needed to be fixed before the final inspection. Analogously, my blog is constantly inspected and reader submit comments requesting corrections all the time. But in my genealogy work, there are no periodic inspections unless I share my files with others, I get no feedback at all. It seems to me that even if we all could somehow agree that there are certain rules and/or principles that apply to genealogy, there is no enforcement mechanism at all and any such rules etc. would be observed only by the most assiduously competent and careful. But there is a segment of the genealogical community that operates as though there were carefully crafted universal rules and further, that those rules apply to all genealogists no matter their degree of involvement or skill. Interestingly, these self-appointed guardians of the genealogical norm, cannot seem to agree very much among themselves as to the content of the rules or even which of the rules apply. Nowhere in the realm is this lack of uniformity more obvious than in the world of citations of authorities and sources. It thought it would be interesting to look at some of the guidelines for submission of articles to the more prominent genealogical publications and see how much uniformity exists. Who would know more about the "rules of citations" than the editors of the genealogical society magazines? NGS Magazine reserves the right to edit all submissions to conform to house style and needs. The NGS Magazine editor agrees to make every reasonable effort to make available to the Writer the final, edited version of the article while there is still time to make corrections. That seems fair enough, I would suppose that if you were too far off base, they would reject the article altogether or tell you to rewrite it with some kind of citations. If I were going to submit an article, I would probably look at several back issues of the magazine and try to emulate the format. Next in line is The Genealogist, a publication of the American Society of Genealogists. Their guidelines are even more terse than the NGS. The editors are particularly interested in single family studies and compiled family genealogies, single-line descents, and articles that solve a specific problem while demonstrating a technique for solution of similar problems. The editors will not draw arbitrary geographic or chronological limits for articles but will continue to exclude queries, which have a proper place in many other publications. They rely on sample articles entirely, which, by the way, are full of lovely footnotes. 8. Question: What is the genealogical standard for documentation (source citation)? 41. Question: Does it really matter what “style guides” I use for writing and citing? As style and reference guides, Genealogy Standards recommends Chicago Manual of Style's ("humanities style,” not “scientific style”) and Evidence Explained! Citing History Sources from Artifacts to Cyberspace (which covers many original record types not handled by CMS). I have published genealogical articles in two major peer-reviewed journals, one in genealogy and one in another academic field. Each of those had its own preferred style. Would those peer-reviewed articles be acceptable "sample work products" to submit at renewal? Answer: Different journals, publishers, and fields do have different style preferences that reflect their needs—often economy or certain situations that exist in their research areas. When submitting work to any press, writers are expected to follow the prescribed style of that press. However, even when major scholarly journals publish abbreviated citations, the research they publish will have undergone extensive peer-review and fact-checking to ensure that it meets standards of the field. BCG welcomes work samples of a genealogical nature that have been published in peer-reviewed journals. Several examples, from a variety of genealogical journals, appear at this "Sample Work Products" link. Your judges will make their own evaluations of everything you submit, based upon their own expertise, but they would not "penalize" you for the fact that your published material reflects the particular house-style of a journal. In order for them to better evaluate your own work, most judges would prefer that you also include a copy of your manuscript, as you submitted it, as well as the final, edited publication. When you submit either unpublished work or published work samples from genealogical magazines that allow you to choose your own presentation styles, BCG's judges would expect you to cite your sources fully by the standards of its recommended guides. The Chicago Manual of Style. Chicago: The University of Chicago Press, 2010. Mills, Elizabeth Shown. Evidence Explained: Citing History Sources from Artifacts to Cyberspace. Baltimore, Md: Genealogical Pub. Co, 2012.
which is currently in its second edition (another wake up call, I have the first edition). Of course, I already knew that different journals, publishers and fields have different style preferences when I began this post. If I continued on with my examples, all it show would be that each one of the publications is different than the others. So, here I am, a lone genealogist out here in genealogyland and what am I supposed to do with my citations? What if I have absolutely no aspirations of ever publishing anything anywhere much less in some prestigious genealogy journal? How am I even going to be able to begin to understand or even become aware of the hundreds of pages of instructions in the the two books cited above? Maybe I begin to wonder why there is such a big deal made about citations at all if even the various organizations and publications of genealogy stuff can't agree? We had a storytelling festival in Mesa, Arizona for a few years. Some of the local people got together and organized a wonderful event with storytellers from all over the country. After a couple of very successful years, the event was turned over to the City of Mesa who managed to kill off the whole event in a few years. In Utah, the Timpanogos Story Telling Festival has been going now for 25 years and it is a major community event and attracts people from all over the world. This is the first time we have had the opportunity to attend in Orem, Utah and we were super impressed with the organization and quality of the event. The City of Orem and many, many local and national businesses are sponsors. There were hundreds of school children bussed in to attend and all was done with a high degree of professionalism. A note about the word "timpanogos." It is derived from a Paiute or Shoshone Indian word roughly translated meaning, "narrow or neck of rocks." This likely refers to the steep walled canyons in the wall of the Wasatch Mountains along the east side of the Utah Valley where Orem and Provo and other cities are located. While at the University of Utah from 1967 through 1970, I helped write an English/Shoshone Shoshone/English dictionary using the main frame computer at the University. Timponogos is the name of a very prominent mountain visible from almost all parts of Utah Valley. If you don't know what this has to do with genealogy, then you haven't been listening to your heart. Genealogy really is all about stories. I went through the "names and dates" phase of my genealogical development when I first started investigating my ancestry about 32 years ago. But even then, I took the time to preserve every scrap of paper that pertained to my ancestry. In my other blog, Rejoice, and be exceeding glad..., I have been writing about the loss of genealogical information when people hoard their research and refuse to share with others. I realized very early in my genealogical research efforts that the heart of the matter lay in the stories and sharing those stories is really what we do as genealogists. I get really annoyed when someone makes disparaging remarks about genealogists as if genealogists were somehow the opposite of the storytellers. This is most evident in statements that say "you don't need to be a genealogist to..." Well, that may be true at one level or another. You certainly do not have to be a genealogist to enjoy stories about your family or help to preserve those stories. But it is the genealogists who discovered or preserved those stories in the first place. Preserving oral traditions is a lot more effort than simply uploading a few copied stories to a website. The collection includes two binders that Wick R. Miller compiled based on the interactions that he and his students had with the Shoshone and Gosiute communities in Nevada and California during the years 1965-1968. These binders contain a wealth of information in their 511 pages, including summaries of interviews with over 100 Shoshoni speakers, and profiles of about 40 speech communities, reservations, and colonies. The profiles of Shoshoni speakers include kinship information, places they had lived, and language background. Some of these interviews included memories of traditional practices that date to the early part of the 20th century or commentary on the state of the American Indian people in the late 1960s. There are in-depth descriptions of woven spoons, pine-nut harvesting, fandangos people traveled to as children, and how particular geographical features tie into traditional stories. Some of the community profiles are extensive and include maps and information on the internal political climate of the communities and insight into the ways the communities were dealing with pressure from outside policies and increasing contact with mainstream American culture. Others are very brief, illustrating the weakening of many peoples’ ties with the Shoshoni community as only a few (or no) Shoshoni speakers who lived there could be named. The information contained in these binders gives us a glimpse back to a place in time that cannot be recovered. Many of the people named are no longer living and much of this information is not available elsewhere. Now exactly the same things could be said about the families of any number of diligent genealogists and historians. Talking about the impact of stories in one thing, collecting and preserving those stories is another thing. I started collecting stores, back when I was still a student working on the Shoshone project at the University of Utah. My very first effort was a tape recording of my grandmother who was a resident of a care center near the campus. Since then, I have collected stories, diaries, journals, oral histories and more. I must admit, I should have done more than I did. I lost a lot of opportunities to talk to older relatives and that loss is permanent. I am currently, once again, involved in yet another oral history project, preserving the oral histories of some of the older people that live in my Ward of The Church of Jesus Christ of Latter-day Saints. Now, if we are going to be promoting stories, photos and documents as artifacts of our family history, I think it would be a good idea to promote the capturing and preservation of these same artifacts from the members of our families today for our descendants. I will write more about this later. Friday, 29 August and Saturday, 30 August, 2014, we are attending the Timpanogos Storytelling Festival. This too is family history at its storytelling best. Sorry for any delay in posting more articles to read. Take this time to read some of the more recent ones you skipped. I will not be mentioning any names. Nor will I be identifying any people, but during the past few months, I have had the opportunity to discuss the economics of genealogy conferences with several very active vendors. These are the people that set up booths or tables at conferences with the hope that they will sell enough of their product to make up the expenses of going to the conferences or even make a profit. The overall picture that they paint is dismal. Unless they are fortunate to be subsidized by a major corporation, collectively they are not optimistic about attending conferences in the future. If they are subsidized by one of the larger vendors, they are cutting back and only attending very large conferences. There are two ways to look at conference attendance; as an advertising expense or as a sales opportunity. Some vendors are there only for the exposure. Others need to make sales to continue business. Who buys genealogically related products at a conference? That is the question to answer. Many genealogy companies are very small business and a significant number would fall into the category of "mom and pop" operations. If they are carefully watching the trends and have gone to a few conferences, they likely have moved as much of their business as possible to direct Internet sales. If I were in the genealogy business, I would be looking for some other way to make a living. Why is all this happening? Lately, I have been talking about shifts in the way genealogy is conducted. We are definitely moving from a paper-based, individually maintained pursuit to an online, collaborative model. If you are a seasoned, experienced genealogist, you may be conducting your research pretty much the same way you did ten or even twenty years ago. But you are living an anachronism. It wouldn't occur to a younger potential genealogist to begin his or her search for ancestors other than online and use one of the online family tree programs. Unless, as a business, you are not addressing this exclusively online market, you will probably not be making many sales in the future. The list could go on and on. Let's say you would think about going to a conference to see one of your "favorite" genealogy experts in person. Now what if you had just watched him or her in a live webinar, where you got to ask questions. Are now anxious to fork over cold hard cash to travel to a conference? One concrete example is the major U.S. conference now coming up on its fifth year: RootsTech. Many of the presentations at RootsTech were recorded on videos and distributed to over 600+ locations throughout the world. We all ready know that will happen again this year a much larger scale. This is a huge benefit to the individual genealogist. It makes available talented presentations that would never have come to a local conference. All of these conferences have been and will be free to the public. If you know that you will have a "free" conference in your area in the near future, why would you plan to pay to travel to a larger conference? Especially, if the same people were teaching at your local conference by video? Younger genealogists are used to watching YouTube and other online presentations. They are involved in Facetime, Google+ Hangouts and other direct video communication. Genealogy does not generate super-star movie actors. Genealogy does not create rock stars or teenage idols. You do not see young people wearing teeshirts blazoned with genealogy company logos. Genealogy does not have the interest of a Comicon, a rock concert or a Star Trek conference. There you go. The smaller free conferences do not need or support vendors. The genealogist benefit from the increased opportunities to learn and mingle with fellow genealogists. If they like, they can still go to one of the big conferences, but the smaller commercially operated conferences no longer support vendors. OK, I have come full circle again. I am back to questioning the stereotypical image of a genealogist and also back to the question about whether or not genealogy even has a definition. First some different questions. Does searching for your ancestors, per se, make you into a "genealogist?" Is there some threshold entry requirement for becoming a "genealogist." Do I become a genealogist the moment that I begin calling myself one? There is an interesting analogy. We have real estate salespeople and we have REALTORS®. As the National Association of REALTORS® likes to frequently point out, "A real estate agent is a REALTOR® when he or she is a member of the NATIONAL ASSOCIATION OF REALTORS®. I think there are those who would like to make a distinction between those interested in family history and GENEALOGISTS. Maybe those who think this way should start coming up with a new trade name? I might also point out that the REALTORS® have an uphill battle. You may wish to read a rather entertaining history of the word in The Word Detective's post "Realtor." Every time I write about this subject, I get comments from GENEALOGISTS who point out that they are eminently inclusive and that they have no intention of excluding any of huddled masses from their own pursuit of their own family history. But we all know that real GENEALOGISTS adhere to certain standards and are usually members of certain organizations. How do we maintain a consistent balance between professionalism and inclusivity? By looking at the real estate community, you can make some interesting comparisons to genealogy. For example, by statute in Arizona, anyone can sell their own property. But it you want to sell property for someone else and make a commission, you must be registered with the State of Arizona. In addition to registration, you have to take a rather long and involved formal real estate course and pass a test. Oh, and you have to pay for and receive a license to "practice real estate." See Arizona Real Estate License - Qualifying for and Obtaining. But even then, you do not become a REALTOR®. As I already pointed out, calling yourself a REALTOR® requires joining a particular organization. Should we aspire to the same sort of regulation for genealogy? I think the main reason this analogy does not work completely is the nature of the product. On one hand, we are talking about real estate. In the United States we can own real estate. We have a formal title system for ownership with government recording requirements that date back into antiquity. On the other hand, genealogy is a nebulous concept of recording information about our ancestors, none of whom we own. I also think that we would have a much harder time trademarking the word GENEALOGIST (with or without capital letters) than the National Association of Real Estate Boards had back in 1916 for REALTORS®. But this analogy brings up some more basic issues. As I have pointed out in previous posts, the number of professionally certified or accredited genealogists is very, very small compared to the number of people who have enough interest in information about their ancestors to put a family tree online. There is no other fact that so completely separates the "serious genealogists" from those who have a casual interest than this one fact. Because I teach at the BYU Family History Library and previously taught at the Mesa FamilySearch Library, I have been in a position for years to hear from patrons. The one most common complaint I hear, as I have mentioned before, is that people are changing my family history on FamilySearch.org Family Tree. This is always said with the attitude that "I am putting in the correct information" and "they" are putting in incorrect information. Of course, what I usually find is that neither the complainant nor the person changing the online record have any sources to support their position. By asking the above questions, I am not advocating creating a cadre of genealogy enforcers. You may be able to cite examples of the abuses of so-called professional genealogists that warrant regulation, but it is unlikely that there are so many occurrences that any state legislature would take you seriously. In any event, as I well know from the practice of law and real estate, just because you have a professional organization and entry requirements does not mean that you do not have issues with professionalism and honesty. This post is more of a component in an ongoing dialogue than some kind of resolution. The dialogue is going on in my mind and I appreciate any comments or input. In quantum mechanics, the uncertainty principle is any of a variety of mathematical inequalities asserting a fundamental limit to the precision with which certain pairs of physical properties of a particle known as complementary variables, such as position x and momentum p, can be known simultaneously. This is sometimes referred to as the Heisenberg principle, but it was formally derived by Earle Hesse Kennard and Hermann Wey. See Wikipedia: Uncertainty principle. One of the most influential books I have ever read discusses the application of the Heisenberg principle and the incompleteness theorem of Kurt Gödel. The book is Hofstadter, Douglas R. Gödel, Escher, Bach: An Eternal Golden Braid. New York: Basic Books, 1979. These mathematical principles were "discovered" and changed mathematics in a fundamental way. So, you say, here we go again, how can this possibly have anything to do with genealogy? Well, humor me. Here is what I have to say on the subject of certainty. In essence both principles boil down to the statement that some measurements can never be precise and some systems cannot ever be proved completely without resorting to proofs outside of the system. These limitations were not known until quite recently. Now, I am not saying that genealogy is very much like mathematics, but there are several concepts that suggest similarities. It has only been quite recently that a large mass of genealogical data has been created in centralized repositories and made reasonably available. Historically, genealogists had to focus their efforts entirely on a smattering of records scattered pretty uniformly all over the world. Those large centralized data accumulations, such as the libraries of the Genealogical Society of Utah (i.e. the Family History Library in Salt Lake City, Utah), the New England Historic Genealogical Society and others were only accessible if you had the time and the resources to travel to the library itself. Now today, most of these scattered collections still exist, but technological changes have made untold millions of records accessible for free or for a moderate cost. For example, even with the advent of microfilmed records, obtaining access to the microfilm could be a slow and inefficient process. You could only guess from the microfilm's catalog description if it might contain information about your ancestors and it was very disappointing to order a film, wait until it appeared and then find that it had no useful information. 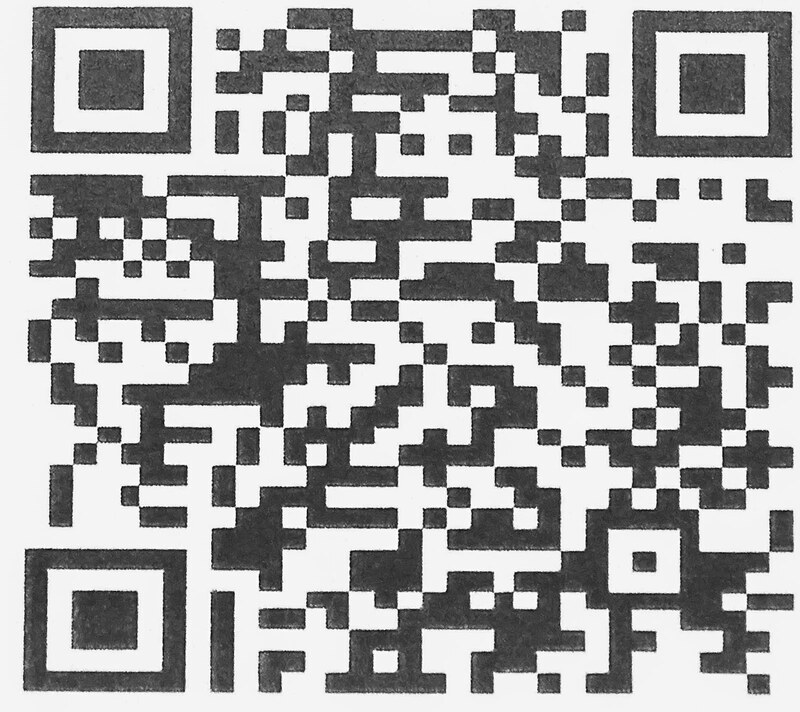 Most recently, advancing technology has resolved some of the microfilm issues by making the images available in digital format online. But the changes being wrought by technology are more basic than just increasing genealogical record availability. The vast accumulations of genealogical source records and online family tree entries are pointing out some ultimate limitations on accuracy and completeness. Ultimately, these physical limitations of the system will be the most significant barriers to genealogical research. The effect of the accumulation of massive genealogical data concentrated online and available to huge numbers of people who, previously, would never of had such access is starting to reveal the fundamental limitations in the overall system. The most evident of these limitations is the level of accuracy of the overall system. Researchers are becoming painfully aware of the inconsistencies and contradictions contained in the accumulation of records. You can rail against the inconsistency, but as we accumulate more and more sources and records, the fact that there are such inconsistencies becomes more and more apparent. For example, it my knowledge of my ancestors was limited to one source, perhaps a surname book or a pedigree chart from a relative, I had one version of my ancestral history. Today, we can have hundreds or even thousands of versions. It is not just the compiled family tree records that are at fault, the very documents we refer to as sources are inconsistent and vague. There are few days that go by that I do not hear the complaints about the inaccuracy of the system. What is less apparent is that there is an ultimate limit to our accuracy. No matter how careful we are and no matter how experienced, we will encounter inconsistency. We will be forced to choose between different dates, places and even different people. It is not that the records are unreliable, it is just that we now have access to multiple versions of the same types of records and multiple records that were either previously unavailable or impossible to obtain. Even if we resort to the time honored "proof statement," in many more cases we will be forced to admit that the conflicting evidence cannot be reconciled. We have found our own genealogical uncertainty principle, the limit of our ability to prove our ancestry. But there is an even deeper issue. That is that genealogy, as such, is incapable of even defining itself. This is similar, in some ways, to the limits imposed by the theorems postulated by Kurt Gödel. By analogy, genealogy can never be completely defined or complete. In saying this, I am expressing a physical certainty. There will always be more records, but the search for absolute proof will never be complete. We cannot even come up with an adequate definition of "genealogy," much less come to a universal agreement as to what constitutes an adequate proof. We can wring our collective hands over these limitations but they are physically imposed by the system we have collectively created. Genealogy will always be uncertain and incomplete. I admit that the title to this post is somewhat techy in nature, but it points out a fundamental shift in the way that computers operate and point out a particularly a shift in genealogy programs in general. Three separate trends have coalesced to create this dramatic change in way I approach the interface between my use of the computer and my genealogical activities. For many years, my involvement in genealogy necessitated that I maintain both a Windows-based operating system computer and an Apple-based system. Quite frankly, the Apple-based system was a matter of choice but because of my extensive involvement in typesetting and graphics that was the best choice. So for many years, we had two computer systems sitting next to each other in our computer room. A few years ago, as we upgraded our Macintosh computer we found that progress in the power and speed of the processor made it possible, for the first time, to practically run the Windows operating system in an emulation program on the Macintosh. At this point, we switched to using two Macintosh computers running Parallels Desktop. The next step in this process, involved a decision by my wife to discontinue using Parallels Desktop for several reasons. Most of these reasons involved the difficulty of maintaining two separate operating systems on the same computer. I continued to need access to Windows-based programs, particularly those I supported and used for genealogy. The reason for my wife's shift away from Windows-based software entirely was not based on any lack of ability to use Windows-based software or work with the newer versions of Windows operating system. In fact, we purchased a third computer to use solely for the few programs that required us to use Windows. So now we have our Windows-based computer sandwiched between two iMacs. This has gone on now for probably the last five or six years or longer. The next step in the process occurred very subtly as online programs and those desktop programs directly connected to online programs began to dominate genealogy. I began to notice that my involvement in Windows-based programs began to decline precipitously with the introduction of several very adequate or even excellent Mac-based genealogy software programs. Continued to maintain my involvement with the PC-based programs because I felt the need to continue to support people coming into the Mesa FamilySearch Library. However, my involvement in teaching programs directly diminished rapidly because other volunteers at the Library were more than adequately capable of teaching the software classes. The increase power and sophistication of the online genealogy programs particularly those programs developed by the larger genealogical database programs. The availability of faster Internet access. The development of programs utilizing connections with the large online databases. Recently, I became aware when I was notified of an upgrade to Parallels Desktop that I had not used the program for many many months, perhaps even in the last year. I still had the latest version of the program on my computer and could easily switch over to use the many programs I had on my computer that required the Windows operating system but I had not used it. Part of the reason, was that I had installed those programs that required the Windows-based operating system on the third computer. The advantage of doing this was the savings in time and frustration of switching from the OS X operating system to Windows on my Macintosh. It was much easier simply to switch to a Windows-based computer. The next shift was highly personal. The number of programs that I used that required the Windows operating system continued to shrink so my involvement with the third computer became less and less necessary. There was another factor that contributed to a shift in the overall use of the computers and that was the increased utility of tablets and smartphones. A significant part of our usage of computers began to be transferred to iPads and iPhones. The increased use of mobile devices highlighted the fact that we were using online programs to a greater extent and that our reliance on desktop programs was diminishing. Obviously, there were some significant exceptions since I still relied heavily on graphics-based programs, but but for genealogy the shift became more and more apparent. One day, I finally realized I no longer needed a Windows based operating system on my Macintosh. All of the programs that required the Windows operating system now been transferred to the Windows machine and frankly, it was much easier to move over and use the Windows computer than waiting around for Parallels Desktop to operate. I also realized that my use of the computer was now dictated by the dramatic shift to online genealogy programs. I expect that this trend will continue. I further expect that this technological shift will begin to seriously change the present use of genealogy programs. I received a link of an excellent summary of the International Association of Jewish Genealogy Societies Conference held in Salt Lake City, Utah recently. Obviously, my perspective of the Conference was considerably different than that of a person who was deeply involved in Jewish genealogy. The post on The Jewish Daily Forward, is entitled, "A Report From the Jewish Genealogists' Summer Camp, The Author of 'The Family' Heads to Utah." I think the post very clearly expresses what I felt and experienced at the Conference as a complete "outsider." It is sometimes hard to break out of our "genealogical comfort zone" and really take the time to learn about an area of genealogy with which we are not familiar. But it is always worth the effort. Genealogy is genealogy and the subject matter is only one variable in a sea of constants. Research methodology is the same no matter what the ethnic background, time period, geographic location or social construct. But in the case of this Conference, there was a distinct difference in the dedication and fierce interest of the attendees. This series of posts consists of links to online websites in different categories useful to genealogists and researchers. The first post listed online digital map websites. The next posts in the series listed both national and state digital newspaper websites. This post was intended to be a list of all of the websites I can find that have collections of digital books. Well, that turned out to be impossibly lengthy. For example, it would include nearly every university and college library and/or special collections department in the world. I finally realized that the list would go on forever, so I settled for a representative sample. Some of these websites will be commercial and have a subscription charge, but even those with a charge for some books may also have a selection of free books. In some cases, you may have to dig down into the website to find the digital books, but they will be there. I finally decided to stick with English language websites. I might try some of the other language websites some time, but the difficulty is determining if they are legitimate or pirate sites without knowing the languages that well. In making this list, it is apparent that there are several large websites that provide online ebook services to libraries. For example, the website Overdrive.com provides a centralized service of digital books only to libraries. Individual users of the Overdrive system gain access to the books in their own public library's online collection through logging in with their library card number and a password. Is this an online digital book collection? That is a good question. The number of books available to the subscribers is substantially different from institution to institution. The question is whether Overdrive is the online website or the local public library? Depending on how you view this question and many others, the number of online websites is determinant or indeterminate. Another example is Amazon.com. It has millions of digital books, mostly for sale. It also has a "free library" of books. Is it a library or a bookstore? Or both? It became immediately evident that the availability of ebooks is changing rapidly. Many of the websites listed have some sort of restriction on access. They are either university libraries where only those associated with the school can access the books or they are private companies or repositories with other restrictions. My goal was to make a list long enough and inclusive enough that you can find a way to acquire access to the material you are searching for. Unfortunately, the list became so tangled that I soon realized that this particular goal was unobtainable. No list of digital books would be complete without a reference to Google Books. Google has clearly amassed the largest online collection of digital books in the world. Some time ago, Google estimated that the total number of books, counting every book ever published to be, 129,864,880. Of course that was back in 2010 and millions more have likely been published since then. The real question is how many of those books has Google digitized? The last estimate was made in April of 2013 and claimed that Google had digitized more than 30 million books. We can assume that Google is still out there digitizing books, so there are probably millions more on the website at any time after 2013. Trove.nla.gov.au, the website of the National Library of Australia, has a published number of books of 18,920,532 as of the date of this post. 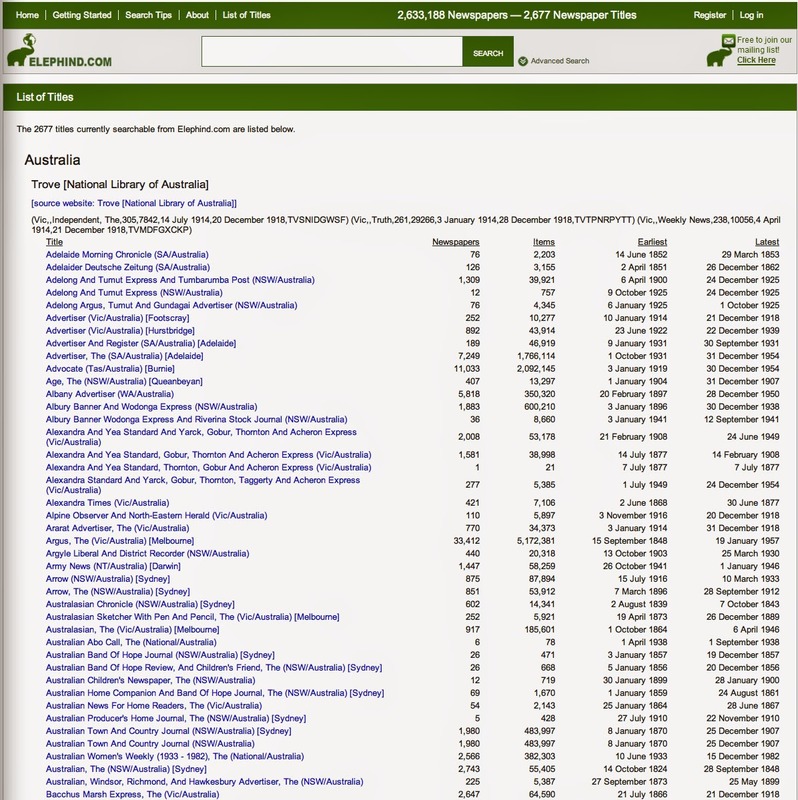 A search in Trove's book collection for the term "genealogy" results in 137,242 hits. The same search on Google Books results in 7,720,000 results. In either case, the number of books is unimaginably large. For genealogists, the online collection of digital books on FamilySearch.org includes the content of several large genealogical libraries. The total number of books is well over 100,000 and growing. When you go to the FamilySearch.org website, click on the Research tab at the top of the page and then click on books. One of challenges of this project is to figure out how to list the websites. I began with the idea to start by listing all the ones I use and/or know about and then move on to all that I can find online anywhere in the world. I have explained what happened at this point. The numbers of books or items listed for some of the websites is more of an indication of their size rather than a current number of holdings. Most of these online libraries continue to acquire more books and other items and the numbers will change daily. What you need to learn from this list and my attempt is to search for a book by title in every case, copyright or no copyright, to see if a website has an ebook for your particular search. Even then, it would be a good idea to search in the larger websites to see if Google missed the ebook. At some point, it will become possible to assume that an ebook always exists and then the search will be to find it online in some sort of library and gain access to the book. Interlibrary loans will very likely become completely digitized. The above list gives no idea as to how many digital libraries exist in languages other than English. The number I found seems endless. Listing digitized map and newspaper sites was nothing compared to the number digital books sites I began to discover. Try searching. You will soon see what I mean. If any of you have experience fixing a dripping faucet over the years, you realize that years ago, you could use a wrench and screwdriver and replace the washer in the faucet and fix the problem. Today, almost all new faucets come with special cartridges and it takes a special tool, in addition to a wrench and possibly a screwdriver or two, to fix the leak. Without that special faucet tool, the job is virtually impossible. Now, as usual, you are probably trying to figure out what this has to do with genealogy. Well, the answer is pretty simple. At one time, you could do genealogy with a pencil and piece of paper. Some people would argue that you still can, but in reality, there are a lot of specialized tools needed to do the job today. One example will suffice, the Family History Library in Salt Lake City, Utah has been digitizing its collection of books and microfilm for a number of years. As books and microfilm are digitized, they are are no longer kept on the shelves or available to order (in the case of microfilm). So, now, just to view the microfilm or digitized books, you need "specialized equipment" such as a computer or other device and a connection to the Internet. Of course, you could reject technological changes and ignore all of the online resources, but sooner or later, just like with the leaky faucet, you either have to obtain the tools to make the repair or hire someone to do it for you. Unfortunately, there are some people who ignore the problem permanently and refuse to "make the investment" in technology, just as there are those who choose to live with leaky faucets. There are excuses. One common issue is economic. Adapting to technological change is viewed a expensive and a luxury. This is an issue of which I am painfully aware. Genealogists today (although this may change) are usually older and at or near retirement. Many live on fixed incomes. But on the other hand, those who plead poverty, are usually unaware of the alternatives available for free computer use at libraries and family history centers. Now we could keep arguing about economics, but these arguments are essentially correct. Being involved in genealogy costs time and money. It is not a particularly expensive activity compared to many very popular activities today. From another aspect, the tools used for genealogy, such as computers, mobile devices, an Internet connection etc. are also general purpose tools. In my case, my wife and I do not have or pay for a cable TV connection. Likewise, we do not have separate land-line telephone service. We very rarely eat out and we do not attend movies or other paid-for entertainment regularly. Some people would be unwilling to "give-up" those activities and services. We don't really care about them and do not feel disadvantaged in any way. On the other hand, I believe in having good tools. A cut-rate, second-rate tool is sometimes worse than no tool at all. We likely spend much more than the average person on computers and the associated software and external devices. We probably use those computers and other devices much more than the average person does also. I think that it is important to fit the tool to the task. If there is a tool that will help me do a job faster, easier, better or at all, then I see the tool as a benefit, not an extra cost. Sure, I could hire a plumber to come in and fix my leaky faucet and pay a $100 or more or I could go to the store and buy the $12 tool and the $25 cartridge and save my money. From another aspect, there is no way I could be writing this blog post without the proper equipment. I look at tools as facilitators. Desktop computers, laptops, tablets and smartphones all facilitate my genealogy work. By maximizing the use of these tools, I maximize my genealogical efforts. These devises and the software that goes with them, are the power tools of my avocation. Sometimes I buy a tool, such as a software program, and some time later, I find out that there is a better program (tool). So, I try the new tool to see for myself. Yes, there is a cost associated with this, but remember, I am allocating time and time to me is more valuable than money. Sometimes the new program moves into my arsenal of tools. Sometimes the new program is a dud and I quickly move on to another program or back to the original one. If we understand that the technology is the tool and that the computers and other devices are the specific tools we use to do genealogy, then the idea of upgrades, technological changes and other issues begin to take on a proper perspective. From the number of comments, it appears that this announcement is driven by user demand. I would suggest that all of us online can and do exert an influence over what the larger genealogy companies do. The market does speak. A few days ago, The Blog@Evidence Explained, Quick Tips blog had a short post entitled, "It's Not Just about Giving Credit Where Due." I read and re-read the post because I couldn't quite agree with the analysis. The argument made seemed to focus on a detail of citation, that is, including the publisher in the citation. However, I disagree with the post's extension of the term "publisher." I think use of this term implies a degree of involvement not present in the examples given. Although, this entire issue is really more of an academic exercise than of particularly genealogical concern, there is an attitude expressed that wants to impose an additional requirement on "serious genealogists" (my term). Mills, E. S. (2007). Evidence explained: Citing history sources from artifacts to cyberspace. Baltimore, Md: Genealogical Pub. Co.
Mills, Elizabeth Shown. 2007. Evidence explained: citing history sources from artifacts to cyberspace. Baltimore, Md: Genealogical Pub. Co.
MILLS, E. S. (2007). Evidence explained: citing history sources from artifacts to cyberspace. Baltimore, Md, Genealogical Pub. Co.
Mills, Elizabeth S. Evidence Explained: Citing History Sources from Artifacts to Cyberspace. Baltimore, Md: Genealogical Pub. Co, 2007. Print. Ancestry.com. 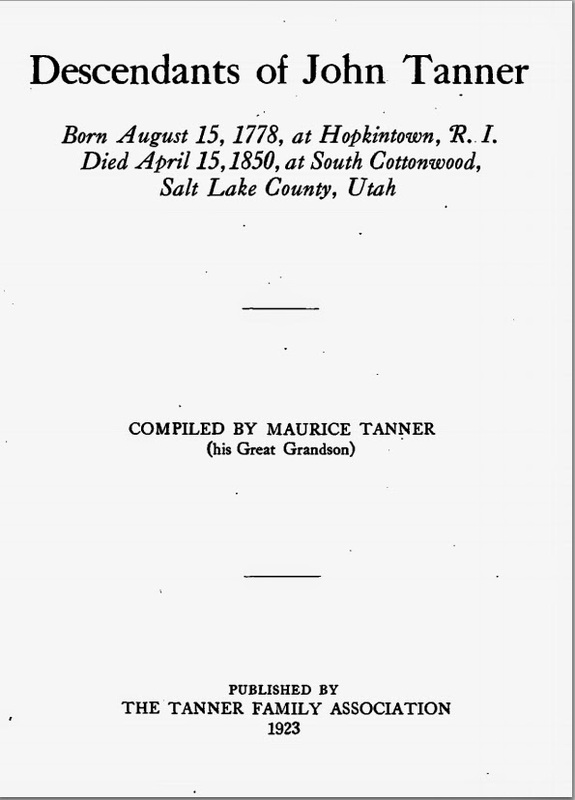 Descendants of John Tanner : born August 15, 1778, at Hopkintown, R.I., died April 15 1850, at South Cottonwood, Salt Lake Coun [database on-line]. Provo, UT: The Generations Network, Inc., 2005. Tanner, Maurice,. 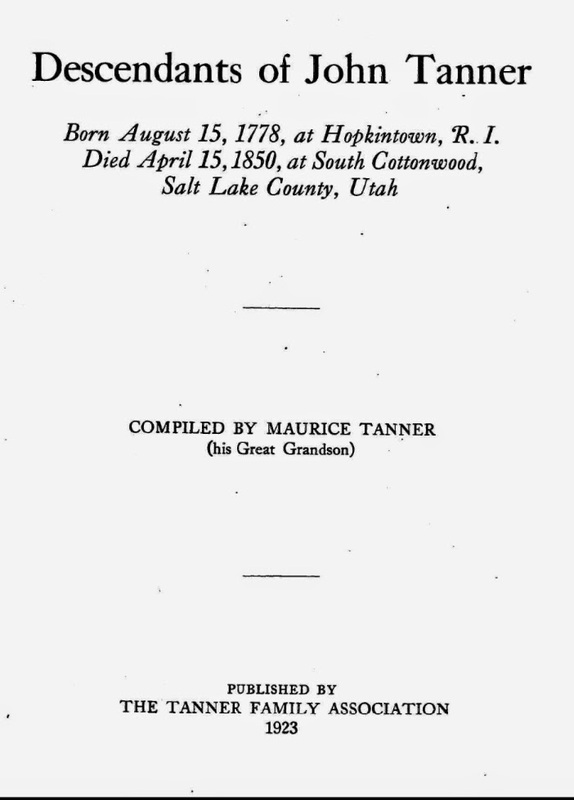 Descendants of John Tanner : born August 15, 1778, at Hopkintown, R.I., died April 15 1850, at South Cottonwood, Salt Lake County, Utah. unknown: The Tanner Family Association, 1923. Now the question here is a little bit obscure, is Ancestry.com more like a library or is it more like the publisher of the book. 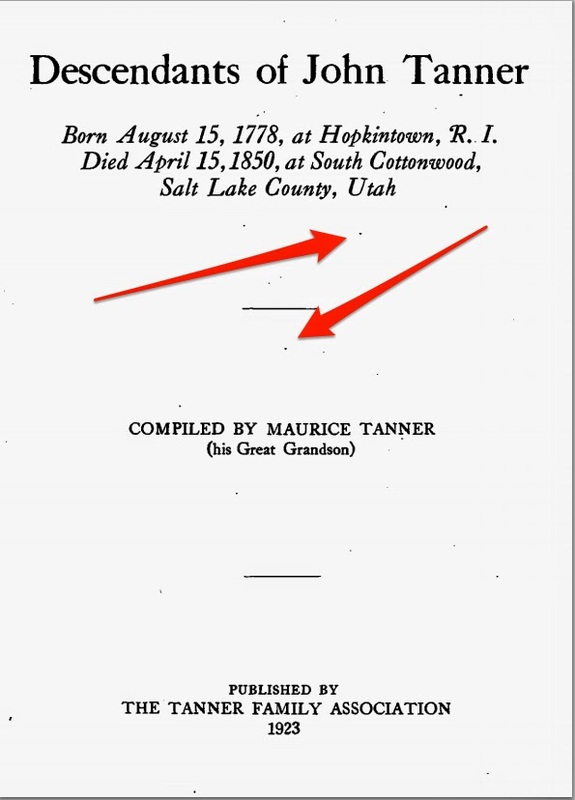 In this case, the publisher is marked as "unknown" but the book is attributed to The Tanner Family Association, located in South Cottonwood, Salt Lake County, Utah. Description: Compiled family history. Includes index. Indexed in the Early Church information card file at the main library only. This looks less like a "citation" and more like a catalog entry in a library. OK, so you got this far in my commentary and you are saying to yourself, who cares? My point exactly. Here is the crucial question. Who published the John Tanner book? What is the purpose of the citation? If you were trying to publish a genealogical journal article in a major publication, you would have to "jump through their hoops" and conform to whatever citation style they required. Does that mean that genealogists in general, especially those with no aspirations to publishing serious academically oriented or professionally oriented journal articles need to conform to one format or another? As I have said many times before, the emperor has no clothes. The idea of a citation in keeping your genealogy is to identify where you got the information so someone else can find it. In the case of the John Tanner book, whether you had a physical paper copy, viewed the book on Ancestry.com or on FamilySearch.org really doesn't matter. What does matter is that there is a reference to the book. In fact, WorldCat.org shows that this same book is in 49 difference libraries in 9 different editions. So aren't FamilySearch.org and Ancestry.com more like libraries? I think so. What does it matter which library had my book? The post cited above argues that putting a copy of the book online is the equivalent of "publishing" the book. The post also dismisses, without discussion, that the online repository of the book, such as Ancestry.com's version, is the equivalent of being a library. But wait a minute. Do we even know if Ancestry.com digitized the book? Not really. Both Ancestry.com and FamilySearch.org could have gotten the digitized copy from the same source which certainly looks like the case. But if we switch to a purely genealogical document such as a copy of a U.S. Census record, it is entirely possible that all or some of the online copies came from the same digitizing source. But by simply acquiring a copy of the U.S. Census, the online service provider does not assume the position of a publisher. If I refer to a record in the U.S. Census, what do you need to know to find that same record? In reality, all you really need to know is that is was part of the U.S. Census. As a genealogist, rather than worry about formatting an "correct" citation to the source, why don't I just include a link to that source? Like I would in FamilySearch.org or Ancestry.com or MyHeritage.com or Geni.com or in my own genealogy program. Or better yet, why not attach a digitized copy of the page to my ancestor in all these programs so you can see the same document. Do you really care if the image came from a specific online database? If you have a copy of the book or article attached, then everyone can find it and any particular format of citation is superfluous. If the document were on a microfilm, I would like to know where you got the microfilm, but I would never consider the microfilm repository to be a publisher of the information on that microfilm. In fact, what I would prefer is that you use any one of the microfilm scanners and provide a copy of the record you are using. Now, if you do have aspirations of publishing your findings in any one of the genealogy journals, then I suggest you get a copy of their style sheet or publication requirements and study it carefully and conform. If you are writing a Masters Thesis or a Doctoral Dissertation, you have the same challenge: conform, conform, conform. But for the rest of us out here in genealogy land, just be sure to give enough information about where you got your data so that I can go back and verify the source. Thanks. Indexed genealogy records are a major boon to the entire genealogical community. It is unfortunate, but many inexperienced researchers fail to take into account the fact that not all of the available records are indexed and further, that there are limits on the accuracy of any indexing project whether volunteer or commercially funded. 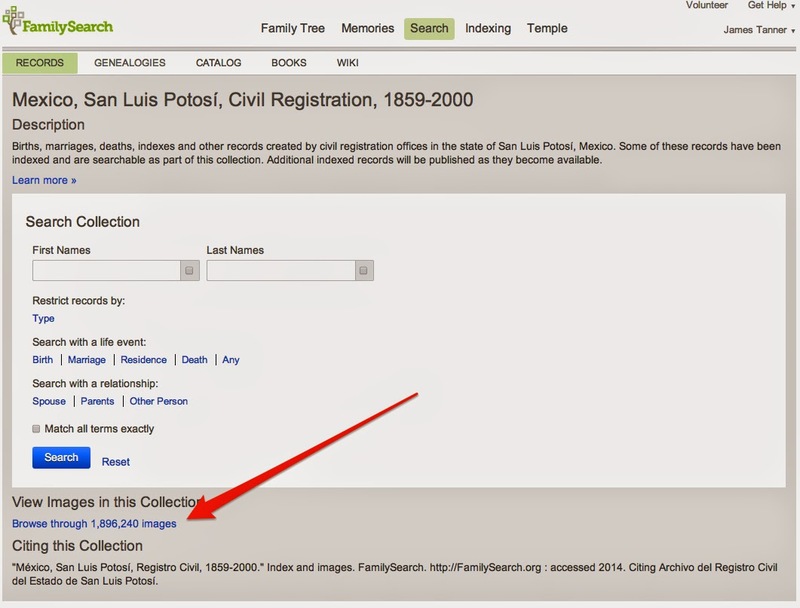 A good example of one major limitation are all of the unindexed images on FamilySearch.org. It is likely that many of these images will remain unindexed for a considerable period of time despite the efforts of tens of thousands of volunteer indexers. With our present technology, the unindexed records, or images, are only searchable by the computer programs if they subsequently individually indexed. I have heard many people comment that they "searched on FamilySearch.org" and did not find anything. Most of these people have no idea that their search only looked at the indexed records. There were likely other unindexed records that would have information about their ancestors. 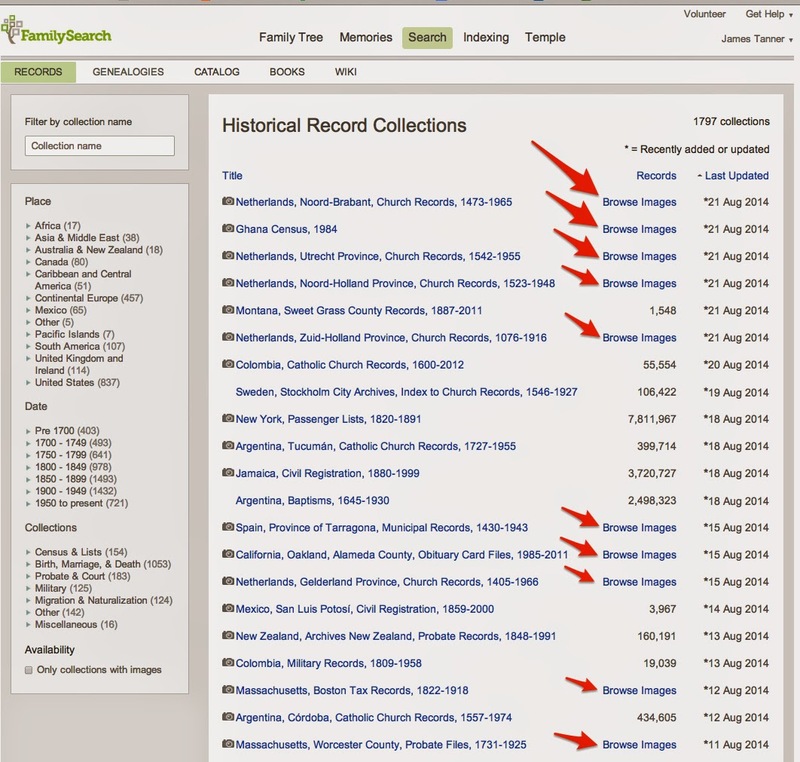 If the collections in the FamilySearch.org Historical Record Collections do not have a number of images indexed and just say "browse images" then the records are only available for a record-by-record search. It is also important to note the total number of images as opposed to the number indexed. It is entirely possible that only a small number of the total images have been indexed and any search by using the program will be incomplete. Yes, all of the arrows point to Collections that are only images and are waiting to be indexed. The list could go on and on. If you use a search engine that relies on a transcribed and indexed record, can you really be sure that what you are looking for is not there? The answer to that question is definitely no. You can never be sure, even if you search the record yourself. That is why I am not an overly avid supporter of Research Logs. If you think you have already searched a record by looking in an index, then you are almost certainly going to be wrong some time in your research. Oh, there is another trap in the FamilySearch Historical Record Collections. The records may only be partially indexed but unless you compare the total number of images to the actual number indexed you might be led to believe you have searched the records when you have not. For example, here is a screenshot showing that Mexico, San Luis Potosi, Civil Registration, 1859 - 2000 has only 3,967 records indexed. There are 1,896,240 images. That means that nearly all of these images are waiting to be indexed and must be searched record by record. Think the next time you rely on an index. I receive some really interesting and thought provoking comments. Occasionally, any response would be too long for a comment. This was one of those comments. Perhaps people use the today's names of cities or towns is because genealogy source information is often filed under the current names of the towns. I am doing a review of which Shackfords were where in the 1790 census and every single source document seems to index people as being in the state of Maine even though Maine was not a separate state until 1820. If I want to do further research for these individuals in this time frame, I need to look under Maine for wills, probate records, and town documents even though these individuals were living in the Commonwealth of Massachusetts. Also, if I want to use the tools in my database where I keep track of the individuals to plot the location of where they lived, I need to use today's location. Just because people use today's locations for birth or residence doesn't mean they don't know that the location was different back then - it may mean that they want to maximize their opportunity to find more source data about the individuals they are researching. The context of the comment was a reference I made to the need to cite the place name of the place at the time the event occurred. I think it is likely correct that genealogy information is "filed" under the name of the place as it exists today. From my view point, I would consider this practice to be based on a lack of perspective as to the need to preserve the historical designations of the places. Why do we preserve the historical designations? The reason is slightly complicated. Let me explain the reasoning by posing a hypothetical situation. Let's suppose that you are researching in a place such as Pennsylvania in the late 1700s. In 1776, The area we now call the State of Pennsylvania was not well defined and had only 12 counties. 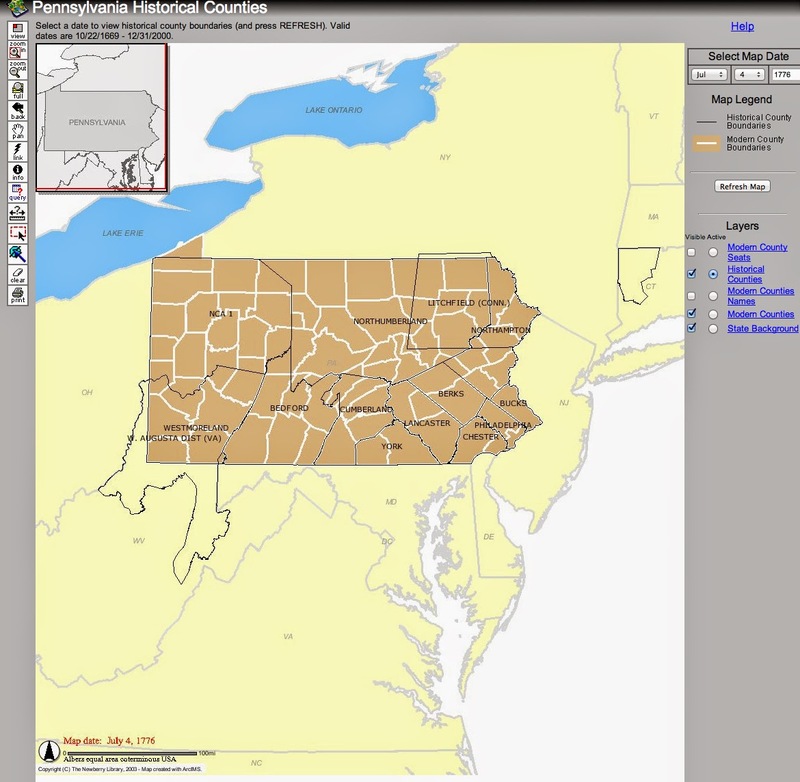 Here is a screenshot of the county boundaries, in black, with the present-day outline of the state and modern counties in white from the Newberry Atlas of Historical County Boundaries. The records could have been sent elsewhere, i.e. to the state, a historical society, a museum, a university etc. So where do you start to look? It is also entirely possible that the existence of the records, if they still exist, is entirely unknown to the present-day custodians of those records. This may seem a little retro, but I am talking here about the actual physical records, not their digital analogs. Now let's suppose that the records have now ended up in the State Archives and are digitized by a large online genealogy database. How do think that the records will be classified? Will you look under Pennsylvania generally or in the specific county existing today or in the area covered by the historical county? Any guess at answering this question would be pure speculation. So why do we need to record the original location? Shouldn't we just stick in the name of the current county and state (or country or whatever) and forget the whole problem? Now the answer gets really complicated. The suggestion made above is one way to approach the problem. That is, record the names of both the original location and the name of the present jurisdictional location. In practice, finding the records is one of the major objectives and goals of genealogical research. Most genealogists think they are looking for names when they should really be looking for records before they even begin to look for names and before they look for records, they should locate events in their ancestors' lives. Too many times, inexperienced researchers conclude that they have searched everywhere for their ancestors when, in fact, they have searched in all the wrong places. Looking at the map above, which could be Eastern Europe or anywhere else in the world, where did the record from Westmoreland County created in 1776 end up? Answer that question after you have definitely located the exact spot of an event in your ancestor's life and you can begin the process of searching for records. Generally searching Pennsylvania records or Westmoreland County records might be helpful, but not focused and not very effective. Searching only the records online is like wearing a blindfold and searching for a pin on the floor. You might find it but it might take a very long time or never. So where are the records located? Everywhere and nowhere. This is what genealogy is all about: finding records. That is why I spend so much time finding out about new places to look. I had heard something about this change, but was waiting to see what the details would be. Apparently, Ron Tanner, product manager for the Family Tree program, gave some of the details that were quoted in a blog post by The Ancestry Insider entitled "Ron Tanner Announces Private Spaces at #BYUFHGC." During this conference, I was in Salt Lake City attending the International Association of Jewish Genealogy Societies Conference. I do not wish to simply repeat what the Ancestry Insider had to say, so I will refer you to his rather extensive explanation. But I will quote from the Family Tree Help menu on "Understanding Private Spaces"
Will living people I add to Family Tree automatically become deceased? Why do I see different PIDs on each family member's account? Does editing living members in Family Tree update LDS Church Membership Records? Are living duplicates automatically going to be merged when a person dies? Each user of Family Tree has a private space. Private spaces help manage data privacy and confidentiality for each user. All living people and their relationships are stored in a private space. Currently, private spaces cannot be shared. Each owner of a copy can modify it independently from others. Deceased persons should each be represented only one time in Family Tree and have a common PID. But a living person can be represented in multiple private spaces as a different Family Tree person, and that person will have a different Person Identifier number (PID) in each private space. Searching Family Tree using a living person's name will not find him or her. Searching by the PID will not find him or her in any other account besides the one that uses the number you are searching for. Living people cannot be sourced. Family Tree does not compute living people, even after they are older than 110 years. Users will need to mark their copy of the individuals as deceased and then search for any possible duplicates. You may also want to refer to the explanation in "How Family Tree displays living people" and "Visibility of living people on Family Tree." This is certainly going to raise a lot of questions. Here is one of the best, concise explanations I have heard concerning the way records are accessed on FamilySearch.org's Historical Record Collections. From time to time, I get questions about accessing records on the large online genealogy sites. This short video explains how and why there are limitations on access. This applies, not only to FamilySearch, but to many other websites. Please take time to view the video and share it where appropriate. A very short blog post on the Quick Tips, The Blog@Evidence Explained, entitled "Finding the 'Core Truth' in a Tradition," started me thinking. The idea behind the list of the "six-step" plan outlined in the blog post is to verify with "first-hand" sources the details of family stories to determine their truth or falsity. The claim is that the six-steps "work every time." I think the whole process of unraveling family traditions and stories cannot be neatly packaged into a six or any other number process. I can use the framework of a very well known traditional family story to illustrate how I think the actual process differs from the never fail solution. To explain this I will have to use a hypothetical example rather than the actual story for a variety of reasons that will become clear by the end of this post. In this hypothetical family story a fairly distant relative has some extraordinary experiences. Let's further suppose that the only "evidence" of the story comes primarily from the ancestor himself and there are no other known witnesses to some the extraordinary events in the story who made a record of the events. It is not that the story did not involve a number of people, but apparently none of them recorded the events that transpired. As you, the researcher, trace the story back, you find the first and only written record of the "story" comes from the ancestor's grandson, who recorded the story after the story teller was dead. In fact, the two individuals' lives only overlap a few years. The story teller died when his grandfather was 5 years old. Further, the person who recorded the story, did not write down the details until many, many years after the story teller's death, when the recorder was an old man himself. The main events of the story occurred when the father of the recorder of the story was also quite young, in fact, a teenager. Now, let's see what happens when you apply the six-steps outlined in the above cited blog post. First, you look to the story itself for clues as to the truth or falsity of the events set forth. You carefully read and re-read the story as reported and determine that there are several clues that might verify the time and place of the story. By following step two, you examine presently available historical documents to determine if there is any independent corroboration of the original story. But remember, the only account of the story, as it is repeated in the family, is rather easily traced to a person who had only a very brief acquaintanceship with the story teller and wrote the story when he was an old man. In addition, in your examination of the story, as it was written, you notice several seriously important differences between the way the story was originally recorded and the way the story is told in the family. You do more research and find that the people who are mentioned in the story actually existed and that they were present at some of the times and places mentioned in the original copy of the story. But unfortunately (remember, this is my hypothetical) none of them left a written account of the events related by the original ancestor, presumably, the story teller and this seems strange since the events as so unusual and striking as to be very memorable. In fact, after a reasonably exhaustive search, none of the events outlined in story tellers story appear anyplace except in the written account dozens of years after the events. It is also strange, that many of the important or even crucial elements of the story are entirely unverified in any other writing and even though the main characters existed, it is hard to place any of them together in the ways the story is related. After following step four of the blog post, you start to strip away any repetitious parts of the story and keep returning to the written account. It is clear that many of the events passed down by the family have no support in the only written record. But, on the other hand, there is no way to disprove the assertions of the recorder of the story. After following step five and weeding out the "hearsay" you are forced to reject the entire story, because the written record is, in fact, hearsay. It is a record of a story told by someone else to a person who was not alive at the time the events occurred and who recorded those alleged events years after the story was related to him. There appears to be no earlier written record at all. So do we find the "core truth?" What we do find is well worn and copiously document history that makes no direct or indirect mention of the key elements of the traditional story. So do we reject the story outright? Is it an embellishment of facts that are generally well known and easily substantiated. Why would the reporter be lying? Or was he? Perhaps, he was actually relating a story that occurred but reported some facts that went beyond the original story. We presently have no way to cross-examine the reporter of the story. We do not know his source in order to evaluate that sources reliability. The added facts will continue to be related by the family members as the "truth" even with the added facts that were not contained in the original written story, which very, very few of the family members have ever read or would even know how to find. Do you want to be the spoiler? Are you willing to go out with your inconclusive evidence and debunk the story? Are you going to become the family police and try and stop the re-telling of the story? What if someone makes a move based on the story and the movie moves even further from the original writing and starts a whole new round of embellishments? At this point, I do not think that the claim "it works. Every time" rings true. What works? In effect, after your investigation, you know nothing more than you did when you started the whole process. You cannot either prove or disprove the story as written and you cannot find any support for the persistent embellishments which have now taken on the patina of truth. If you reject the story, you are a spoiler. If you accept the story as told, you are intellectually dishonest. If you insist on referring to the written version of the story as the only "true" account, you are still intellectually dishonest. The story's elements cannot be either proven or disproven. But as a tradition it is unassailable. What is the core truth? With today's added emphasis on stories as passed down through families, it is important to distinguish between "stories" and documented history. Sometimes the documented history is more remarkable than the stories passed down as tradition. Sometimes it is the other way around. The popular view of stories is that they add life and substance to the dry old history. That may be true, but what happens to the people who discover that the stories have no foundation? Many efforts in the world of historical research have been conducted for the purpose of proving or disproving a traditional story. Frequently, the historical research discovers that the "facts" are just different. The events were just as remarkable as the story, but the tradition has no support. It is not hard to find such stories. All we have to do here in the United States is go to traditional stories about George Washington and Abraham Lincoln and many, many others. Other countries are also not immune. Some of my own ancestors came from Australia and a popular story there is "The Man from Snowy River" that was the subject of a popular movie of the same name. See Wikipedia: The Man from Snowy River (poem). In this case, the story, which is an entirely fictitious poem, has become the "reality." Do we reject the poem because there is no reality? Does the poem still have the power to inspire people to have an interest in their history? What about my hypothetical story above? Do we have a place in genealogy for the story apart from the unproven historical reality? In 2011, all volumes of the Registers of Births, Marriages, and deaths of Jewish communities deposited in the National Archives were digitalized. In the course of this year they will be gradually made accessible on: www.Badatelna.eu First of all there will be volumes from the fond „ Matriky židovských náboženských obcí v českých zemích“ (HBMa)(Registers of Births, Marriages and Deaths of Jewish Communities in the Czech Lands) for the publication of which the original inventory was used after some improvements. The registers, needing substantial preservation and restoration interference, were exempt from the process of digitalization and will be scanned later. Similarly, there will be published, with delay, those volumes of the registers where errors found during checking of snaps are then corrected. In accordance with the Register of Births, Marriages, and Deaths Act (N.301/2000 Coll.) only entries older than 100 years from the last entry in the Births Registers and 75 years from the last entry in the Marriages and Deaths Registers will be made accessible in the individual volumes of the HBMa fond. The restriction does not apply to the Jewish control registers owing to the time range of entries. The entire article with instructions can be found by clicking here. Elephind.com makes the claim to search all of the world's digital newspapers at one time. This may be an overstatement, but it does have a search engine that will search 141,628,238 items from 2,677 newspaper titles. Its collections are decidedly slanted to newspapers from Australia and New Zealand but it does have papers from places as diverse as Singapore and Mexico. Part of the huge collection comes from a link to the National Library of Australia's website Trove.nla.gov.au. Another part is linked to the Library of Congress's Chronicling America website. As with any large online database, if you find your ancestors you think it is great. If you don't find your ancestors, you don't think it is worth much. But like everything in genealogy; the game is in the search. Where are the rest of the newspapers? Are you exhausted by being reasonably exhaustive?